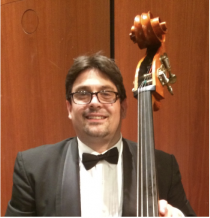 In addition to UCA, Joel Schnackel teaches Suzuki double bass at the School of the Performing Arts at Bellevue Baptist and keeps a private bass studio in Memphis, TN. When he is not teaching bass, he performs in the Jackson Symphony, the Arkansas Symphony, the North Mississippi Symphony, the Tuscaloosa Symphony, and Savannah Philharmonic. Joel holds a M.M. degree in double bass performance from the University of Memphis, a B.A. degree in music composition and technology from the University of Montana, and is currently ABD, working on his Ph.D. dissertation in historical musicology.